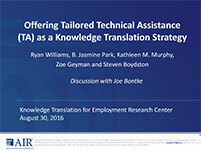 Ryan Williams, PhD, Research Director for the Center on Knowledge Translation for Employment Research will present findings from a study testing a knowledge translation strategy among a business-oriented audience. Joe Bontke, Outreach Manager and Ombudsman for the Houston District office of U.S. Equal Employment Opportunity Commission, will join Dr. Williams for a lively discussion about the implications of these research findings. DATE: This webinar took place on August 30, 2016.